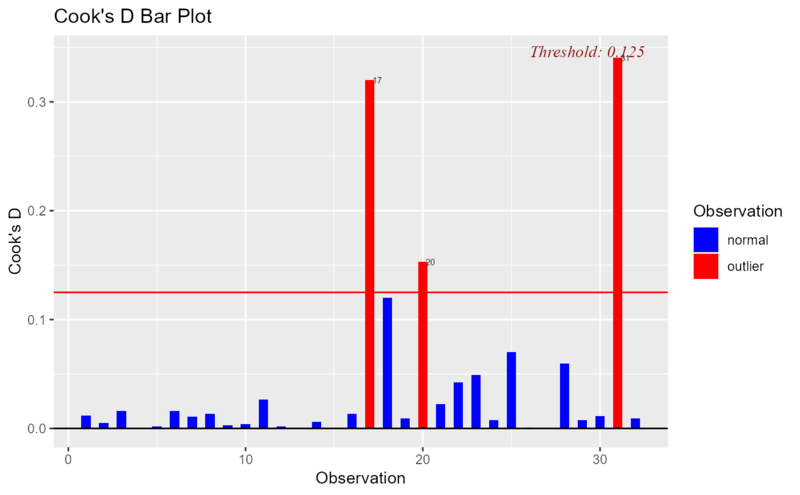 Bar Plot of cook's distance to detect observations that strongly influence fitted values of the model. Cook's distance was introduced by American statistician R Dennis Cook in 1977. It is used to identify influential data points. It depends on both the residual and leverage i.e it takes it account both the x value and y value of the observation. Delete observations one at a time. examine how much all of the fitted values change when the ith observation is deleted. A data point having a large cook's d indicates that the data point strongly influences the fitted values. ols_cooksd_barplot() has been deprecated. Instead use ols_plot_cooksd_bar().